A few weeks ago I read a review over at Newbie DM and instantly went out and purchased it from DriveThruRPG. Encounter Decks 3 by Inkwell Ideas. Encounter Decks 3 is, obviously not the first encounter deck released by Inkwell ideas, but it definitely seems to be the best so far. Every card contains a map on one side, and an adventure idea on the other. The map now, unlike previous versions, goes with the adventure. These cards are so incredibly perfect for how I DM, with a highly improvisational style. But I definitely think any Master of Dungeons could benefit from these cards. The maps are good, (although I tend to not rely on maps too often) but the adventures really make these cards worth it. 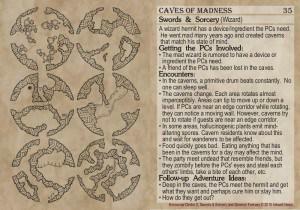 They're split into two main categories: Swords & Sorcery, and Science Fantasy, which at first seemed like a drawback for me, since I prefer to not run science fiction styled campaigns, but all of the cards are written in a way that it would be incredibly easy to convert one to the other. A mad scientist trying to rebuild a dead body becomes a necromancer trying to summon skeletons, that sort of thing. They're also system agnostic, so can easily be worked into any system or version that you play at your table. The deck is sold as both a PDF or a physical copy, but I highly recommend the physical copy (which can also come with the PDF), the PDF makes it difficult to tell which map goes with which card, and defeats the entire purpose of having an easy to randomize pack of adventures at your fingertips. I've used these cards already at the table and they were immensely helpful, having all of the information on one card makes it very easy to reference, and there are enough different encounters on each card to provide easily a night's worth of fun. I really can't recommend these cards enough, I have never encountered (get it?) a product that can so revolutionize my games like these have. I really commend Inkwell Ideas, and I'm jealous I didn't think of it. I hope they go on to make dozens more of these packs, and I can promise that I will buy every single one. Make sure to pick up a copy here. They're under $10 for a physical copy, so there is really no reason not to.